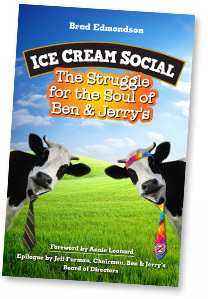 “People who buy Ben & Jerry’s ice cream are intensely devoted to the brand. A few months ago, when I was finishing up the research for my book about the company, I heard a young woman thank co-founder Jerry Greenfield for helping her get over the end of a love affair. Greenfield had no idea what the woman was talking about, until she explained the custom of buying a pint of one’s favorite flavor and, between sobs, eating the whole thing. It gets you through the night, she said.